As science grows, newer technologies bring changes in professional practices. The field of audiology has also witnessed such changes around the world and in India too. Such changes have not been systematically recorded and the scope of these changes has not yet been analyzed. The field of audiology has undergone many changes since World War II. At that time, diagnostic audiology consisted essentially of the magnitude and the type of hearing impairment. Now, with the advent of sophisticated non-invasive procedures such as a high-frequency probe tone acoustic immittance and brainstem auditory-evoked potential, Audiologists assist in the diagnosis of etiologies of various types of hearing impairment such as middle ear effusion, retrocochlear disorders, ossicular discontinuity and ossicular fixation. The management of hearing impairment has also changed dramatically. Few years ago, it consisted primarily of fitment of body level hearing aids and that was it but, then the trend shifted toward miniaturization and sophistication of hearing aids and assistive devices. With the advent of digital technology, the analog hearing aids have given place to digital hearing aids. Along with it various assistive listening devices have come up to aid persons with hearing impairment in coping with the activity limitations and participation restrictions due to hearing loss. Needless to say that, the change has come with a cost to be borne by the needy. As more and more sophisticated and state-of-the-art technology are finding place in the routine practices of Audiologists in terms of diagnosis and management the older, traditional and simpler diagnostic and management options are being rendered obsolete. Furthermore, it alters the cognitive preparedness on the part of the clinicians. The audiologic test battery was developed for the purpose of differentiating between cochlear and retrocochlear etiologies. The test battery has undergone a change in the last 30 years. According to Prescod,  the test battery for the assessment of acoustic neuroma includes pure tone audiometry, speech audiometry, Bekesy audiometry, tone decay testing, short increment sensitivity index (SISI), alternate binaural loudness balance (ABLB), impedance audiometry and tuning fork tests. These tests are not only simple to be done, but also economical requiring only the basic instrumentation. They were considered as a reliable tool for the site of lesion (SOL) testing. Tillman  reported a hit rate (presence of types III and types IV Bekesy audiograms) of 70% for his group of 23 cases with eighth nerve pathology. He also reported a false alarm rate of 0% for conventional Bekesy testing in his 23 patients with Meniere's disease making it a strong SOL test among the test battery of tests used for differentiating between cochlear versus retrocochlear pathology. Similarly, Tillman reported that, with the Carhartt tone decay procedure, 96% of his 23 Meniere's disease patients had negative tone decay. Likewise, Morales-Garcia and Hood  reported that 96.5% of their 29 patients with Meniere's disease or noise induced hearing loss had a negative tone decay, which indicates the tone decay test is a sensitive indicator of cochlear pathology. For SOL tests, use of behavioral tests such as Bekesy audiomtery, SISI, ABLB and tone decay tests has drastically reduced. Audiologists are now relying more on physiologic tests like ABR and acoustic reflex tests. But for detection of cochlear site lesion, sensitivity of behavioral tests is more in comparison to physiologic tests. For eighth nerve lesion detection physiologic tests have more sensitivity. Physiologic tests have their limitations like reflex results on moderate to severe sensorineural hearing losses may not differentiate cochlear and nerve lesion. For ABR, interpretation is difficult in case of high frequency sensorineural hearing losses. Thus, we see behavioral tests are very important tools for the detection of cochlear lesion detection as well as when the physiologic test results are equivocal. This trend shows economic behavioral tests have been replaced by costly physiologic test. The significant advances in instrumentation in recent years have brought new ethical challenges. According to Dunn et al. as the Audiologist is presented with improved technology for assessing the auditory system, scope of practice challenges occur and issue of competency come to force. How does the profession assure itself that individuals will not engage in these new clinical areas using recently developed instrumentation in the absence of training and demonstrated competency? Especially more so, as the traditional tests are being considered obsolete due to which the clinicians are under peer pressure to apply these tests. In terms of management, five basic types of hearing aids are available today. These are body aid, eyeglass aid, behind the ear aid (BTE), in the ear aid (ITE) and in the canal aid (ITC). When the electroacoustic hearing aids were first developed several decades ago, the body aid was the only type that was available. In the ensuing years, the other types of instruments were developed. Relative advantage of different hearing aid styles was examined. The results suggested that BTE had greatest advantage over completely in the canal aid (CIC), ITE, ITC in terms of ease of manipulating user controls, high gain and maximum output, directivity, reliability, compatibility with telephones, flexibility (for non-programmable), ease of cleaning, avoidance of occlusion and feedback. Although, the body level had greatest advantage in spite of high gain and maximum output, reliability, ease of manipulation and user control, avoidance of occlusion and feedback and cost. Then what would be the reason for the disappearance of body aids and BTEs?. Now this is where the Gresham's law manifests itself. Gresham's law states that "The bad drives away the good and the bad money drives away the good money out of circulation." In the context of audiological practice, the equivalent law would state that with the advent of more  recent and costlier versions of test procedures and management options for hearing loss, the time tested cheaper ones would be replaced. A study titled, treating inflammation: Some needless difficulties for gaining acceptance of effective natural products and traditional medicines by Butters and Whitehouse  suggests that, though the quality of so called natural remedies is extraordinary variable, more stringent evaluations of anti-inflammatory and anti-pyretic activities in rats can help resolve some of the uncertainties surrounding the preparation of some herbal products and animal products which can then become remarkable resource for supplementing conventional/allopathic therapy. However, the healing profession and the general public needs to examine more carefully the criteria for quality in any alternative medicine to ensure the good (=reputation and product) are not destroyed by the bad in-essence counteracting Gresham's law, which states bad tends to replace the good. Another study has been done relating polio vaccine and Gresham's law by Sathyamala and Puliyel,  As injectable polio vaccine (IPV) is available as well as oral polio vaccine (OPV), private practitioners dispense an injectible vaccine to those who could afford it and the vaccine manufacturers ensure that there is sufficient incentive to use the new vaccine, while the government continues to use the OPV. Now, applying the Gresham's law, with the advent of more expensive vaccine alongside a cheaper one the cheaper version will disappear from the market. The Government of India is in quandary. It has given up its capacity to manufacture oral vaccine indigenously on advice from the overseas. User fee will have to be introduced for the IPV. The indigent will remain unvaccinated. It is then, that the big surge of polio will sweep across the country, among the unvaccinated. In context of audiological practice, the Gresham's law would state that with the advent of more recent and costlier versions of test procedures and management options for the hearing loss, the older and cheaper ones would be replaced as we have seen happened with the disappearance of body aids in United States. But this is not desirable in a country like India, which is a developing nation and the majority of its citizen cannot afford such state-of-the-art technology. Therefore, a study is undertaken with an aim to examine the essential and desirable changes in audiological practices in India. To study the current trend practiced by the Audiologists in India in terms of assessment. To study the current trend followed by the Audiologists in terms of management. To study the practice norms as advocated by senior professionals and. To study whether Gresham's law is manifesting itself in the current audiological practice being followed in India. The research conducted was survey type. The participants were practicing Audiologists. The survey questionnaire "Current audiological practices: An opinionnaire" is shown in the appendix [Additional file 4]. It consisted of two sections. The first section included the demographic information about the participant's years of experience in the field, age, gender, qualification, whether working in a government or a private set up and the average number of cases seen daily. The second section consisted of two parts. The first part contained questions about the assessment practices being followed by the professional. The participant had to rate their responses on a 10 point scale, where one meant "least preferred" and 10 meant "most preferred," about the essentiality and desirability of each test in pediatric, adult and geriatric population. The assessment procedures included in the study consisted of use of basic pure tone audiometry to use of auditory steady-state response (ASSR) in identifying the degree of loss. The second part consisted of questions about the management practices being followed. Here also, the participants had to rate their responses on a 10 point scale, where one meant "least preferred" and 10 meant "most preferred," about the essentiality and desirability of each management option in pediatric, adult and geriatric population if they had mild to moderate loss and if they had profound loss. The management options included in the study consisted of providing body level hearing aid to cochlear implants in the varied population. More than five point rating was taken as high for each item. A total of 100 questionnaires were sent to Audiologist professionals through E-mail and post. The response was obtained from 68 of them. Thus, the response rate was 68%. Based on the demographic data the participants were grouped into two; group A as those who are practicing and group B as those who are in academics and are in a head staff position. The groups were chosen so that group A represented the Audiologists in direct practice and client dealing while group B represented Audiologists who were in senior position in terms of professional experience and qualification as they were in senior staff position and in academics. The number of respondents in group A included in the study were 42 (N1) and number of respondents in group B were 26 (N2). The mean were obtained for responses given by the participants for each of the items included in the questionnaire. The mean rating values of tests that were indicated as essential in routine practices by both groups were compared using t-test. As seen in Graph 1 [Additional file 1], among tendiagnostic test options, PA rated seven tests as essential for pediatric as well as geriatric population. 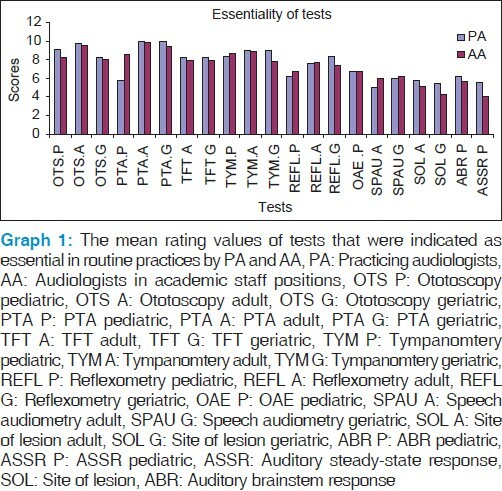 Audiologist in academic position rated only six tests as essential in pediatric as well as geriatric population. For the adult population, both groups rated 7 out of 10 tests as essential. Higher rating is seen for the SOL tests by the PA (5.4) than the Audiologists in academic positions (4.22). 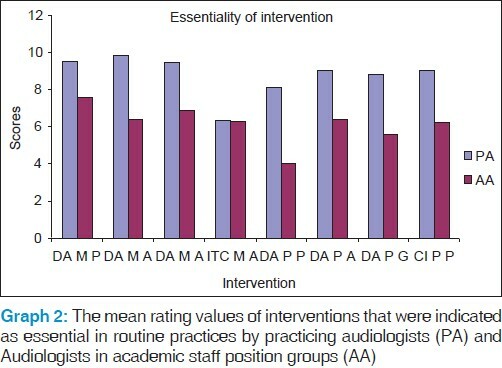 Graph 2 [Additional file 2] shows that among the management options, high rating score was given for digital hearing aid as a management option for pediatric, adult and geriatric population groups by PA (8.11, 9.05, 8.84) than Audiologists in academic positions (4.00, 6.44, 5.55). 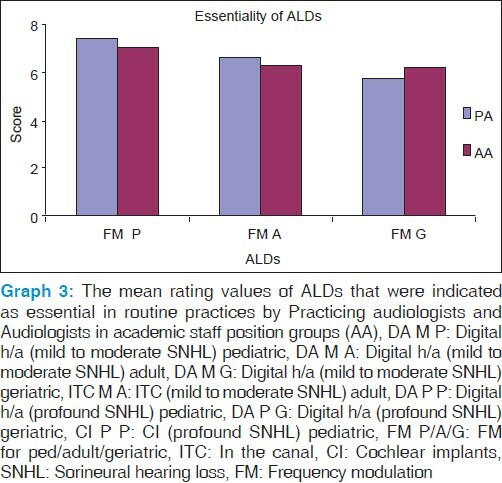 Significant difference was found between mean ratings given by PA (9.89, 9.47) as against Audiologists in academic positions (6.44, 6.88) for managing adults (P = 0.004) and geriatrics (P = 0.01) with mild-moderate hearing loss with digital hearing aids. Significant difference was found between mean rating, given by PA (8.11) as against Audiologists in academic positions (4.0) for prescribing digital hearing aid to pediatric (P = 0.01) and geriatric population (P = 0.03) with profound hearing loss. Significant difference was found between mean rating, given by PA (9.05) as against Audiologists in academic positions (6.22) for prescribing cochlear implants to the pediatric population (P = 0.04) with profound hearing loss. With respect to Assistive technology, as shown in Graph 3 [Additional file 3] both groups gave high rating for frequency modulation aids as essential in all age categories. The results indicate that the audiology field has changed with an increased demand for more sophisticated and costly options in both diagnostic as well as an intervention area, which is being reflected by higher preference for an advanced diagnostic tests option and costly hearing aids and assistive devices. Scoring pattern between both groups is similar, but certain newer versions of assessment and management were rated higher by PA than staff heads and professionals in academic field. The reason for this may be attributed to the fact that the professionals involved in direct client dealing are more inclined to use costlier, sophisticated and most recent technologies due to various factors such as the peer pressure to appear updated, more financial incentives, etc., while those in head staff position and in academics have no such pressure and seem to give more importance to what appears practical. In seeking solutions for reasons best known, scientists have applied theories of normal function as well as dysfunction for example in the treatment of stuttering the treatment techniques are based on theories of stuttering, whereas, in the treatment of hearing impairment the focus is on theories of hearing. The process of commercialization and commerce have regulated the end product reaching the masses while Bekesy audiometry could lend insight into the hearing status of majority of the population affected by hearing loss with negligible training as well as cost. The commercialization and professionalization of the discipline have kept such services out of reach of millions of people. Caution has to be exercised and appropriate practice norms as well as an ethical norm have to be evolved and practiced if the catastrophe effect such as global warming to add insult to injury to people with hearing impairment is to be avoided. There is a rising trend among Audiologists to use more updated versions as against older, low cost versions of assessment and management options in the assessment as well as intervention of the clients. The traditional, old, economical options being replaced by newer, costlier people unfriendly versions are suggestive of manifestation of Gresham's law. This in turn may result in restricted coverage and drain on limited resources of families. 1. Prescod SV. Audiological Handbook of Hearing Disorders. New York: Van Nostrand Reinhold; 1978. 2. Tillman TW. Special hearing tests in otoneurologic diagnosis. Arch Otolaryngol 1969;89:25-30. 3. Morales-Garcia C, Hood JD. Tone decay test in neuro-otological diagnosis. Arch Otolaryngol 1972;96:231-47. 4. Bess FH, Humes LE. Audiology-The Fundamentals. 2 nd ed. NewYork: Thieme; 1995. p. 239-41. 5. Martin FN, Champlin CA, Chambers JA. Seventh survey of audiometric practices in the United States. J Am Acad Audiol 1998;9:95-104. 6. Hall JW III. Classic site of lesion tests: Foundations of diagnostic audiology. In: Rintelmann RF, editor. Hearing Assessment. 2 nd ed. Austin: Pro-Ed; 1991. p. 653-77. 7. Stach BA, Lerger I. Immittance measures in auditory disorders. In: Lacobson JT, Northern IL, editors. Diagnostic Audiology. Austin, TX: Pro-ed; 1991. 8. Musiek FE. Auditory evoked responses in site of lesion assessment. In Rintelmann RF, editor. Hearing Assessment. 2 nd ed. Austin: Pro-Ed; 1991. p. 653-77. 9. Dunn HH, Roeser RJ, Valente M. Audiology Practice Management. NewYork: Thieme; 2000. p. 44-5. 10. Dillon H. Hearing Aids. NewYork: Thieme; 2001. p. 282-4. 11. Rolnick AJ, Weber WE. Gresham′s Law or Gresham′s Fallacy. J Polit Econ 1986;94:185-99. 12. Butters DE, Whitehouse MW. Treating inflammation: Some (needless) difficulties for gaining acceptance of effective natural products and traditional medicines. Inflammopharmacology 2003;11:97-110. 13. Sathyamala C, Puliyel JM. Polio vaccine and Gresham′s law. Indian J Pediatr 2004;71:1141.